They have totally different “feels”, depending on the amount of each color, and the contrast between colors. Â The lighter valued (paler) colors feel lighter and brighter (the white is almost garish compared to the other two), the darker colors more sober. Â The middle one is more subdued, primarily because the sage background doesn’t contrast strongly with either sage or olive, reducing the total contrast in the piece. Â The bottom one feels powerful and energetic, with the strong contrast between olive and white. And that’s with only three colors, in monochrome! These two also have totally different “feels”, even though all I did was swap the blue and orange-gold colors. Â The blue is calmer and more conservative, the orange brighter and bolder. 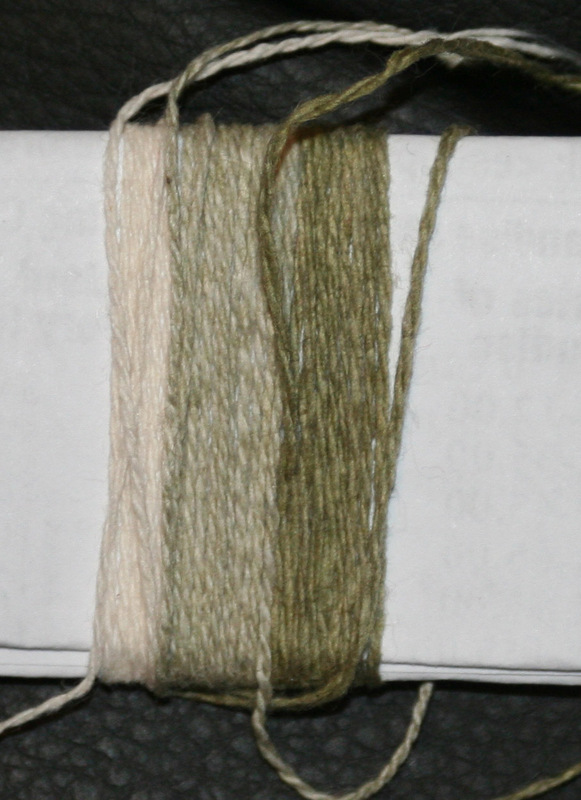 natural, "sage", and "olive" yarns! 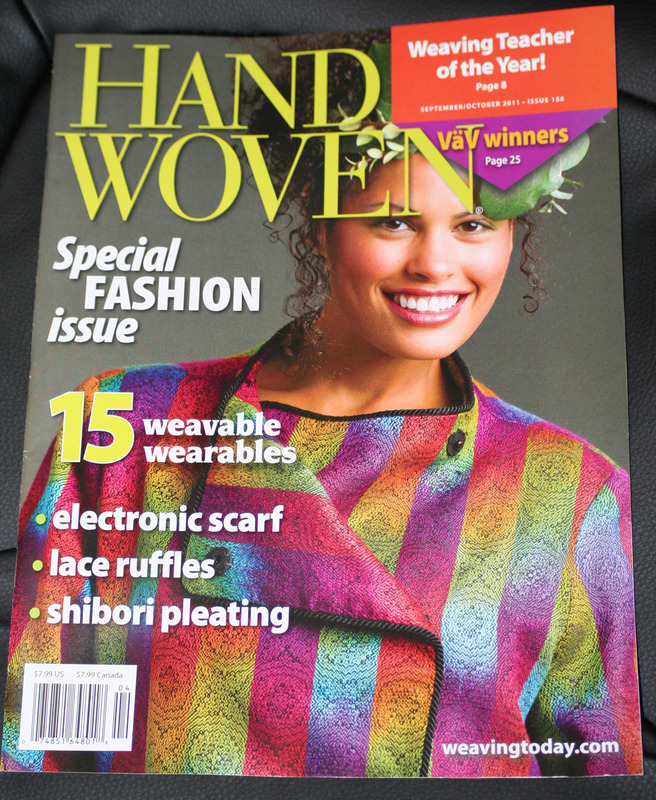 This would NOT do for the article; not only was it the wrong color, there wasn’t enough contrast to illustrate the point I wanted to make.Â And I was slated to start weaving it next weekend! I leaped for my computer and ordered some more yarn from Webs.Â If they sent it out first thing tomorrow morning, it would arrive in time.Â Then I remembered that colorgrown yarns change somewhat after washing.Â But surely not THAT much? Then I got up this morning and read Sharon Alderman’s latest post on her blog, which was timely and important!Â It showed what happens when you boil colorgrown cotton with a little soap and washing soda to take out the wax.Â And lo and behold, a dramatic color change from dull beige yarns to dark and light greens! So I got up and did the experiment myself.Â Voila! Magic!Â This would do perfectly. So I called up Webs immediately to see if I could cancel my order – and, thankfully, I could. But it just goes to show the dangers of assumptions, doesn’t it? Meanwhile, the Infinite Warp is now fully threaded and sleyed.Â I have not tied it on yet because I need to make some adjustments to the Fireside rolling temple before I can put it on the loom, for which I am missing a critical tool.Â I’ve ordered it from Amazon and it should arrive today, so I’m hoping to start weaving tonight! Tomorrow morning, meanwhile, it’s off to class for me.Â I have had a vague interest in metal clay work for awhile, and while looking for classes locally, I found a very interesting-looking class in Richmond (which is about an hour’s drive away).Â It’s a one-day class on using porcelain colors on silver clay, to produce color on silver without enameling.Â This would let me produce some very interesting (albeit expensive!) metal buttons for my handwoven garments, should I choose to do so.Â So I signed up for the day-long class.Â It should be interesting to see what comes out of it! In between winding bouts of the 37-yard warp (fifteen bouts down, nine to go), I’ve been frantically sketching out the framework for my article about color. Â I have a pretty decent understanding of basic color theory, but one could write entire books about color theory (and many people have!). Â How to distill the basics down into three magazine pages or less, including photos and project information? But I think I’ve gotten most of my ideas out in about a thousand words, and with some serious editing I think it can be made to fit. Â I’ve also designed some samples that I hope will be illustrative. Â I really sweated over the sample design – each of my four samples will illustrate many points about color theory, and be pretty enough to weave as a project. Â Now I just have to make the samples! Fortunately for me, a very generous friend (hi Ginny!) has agreed to let me borrow her loom, so I can weave up my samples while The Infinite Warp is on my loom. Â I’ve ordered the yarns that I’ll need, and sometime in late August or early September, I’ll run on up to her place to do the weaving. 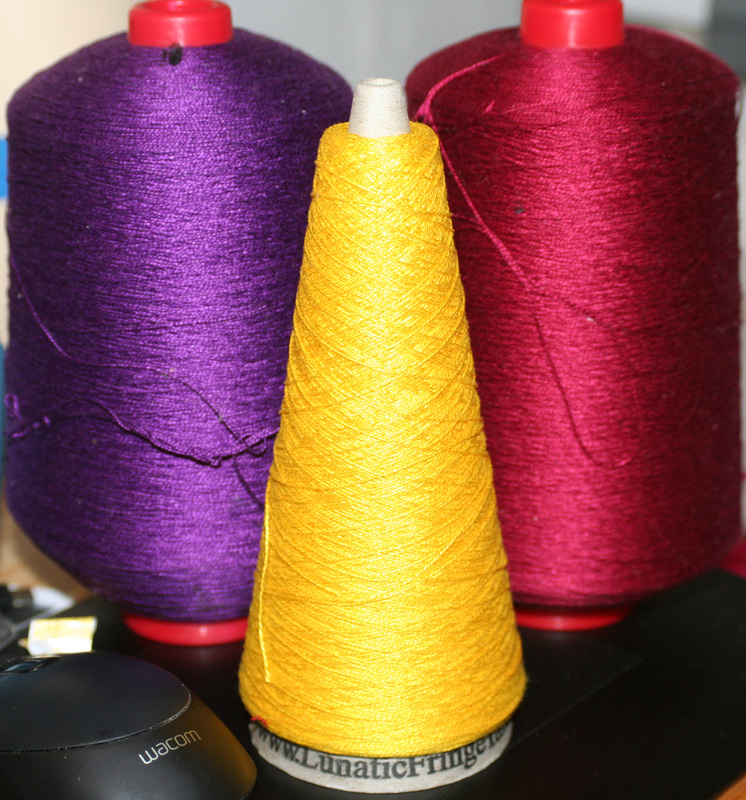 ....or purple, burgundy, and yellow? There is a profound difference in the way the colors harmonize (or not! ), even though the gold and yellow are relatively close in hue, and this is one of the things I think would be interesting to write about. For an article I’m writing, I need to weave a couple of quick samples, all in different structures, from the same profile draft, and about 4-5 inches square (they’re destined to be mug rugs). Â For efficiency, I wanted to get as many structures as possible from the same threading. Â All structures had to be weavable on eight shafts or less. This was a bit of a challenge. Â Finally, after much pondering, I figured out how to get a bunch of different structures from the same threading: use a very dense sett, and weave double weave, rep, and two layers of turned twill on the same threading! 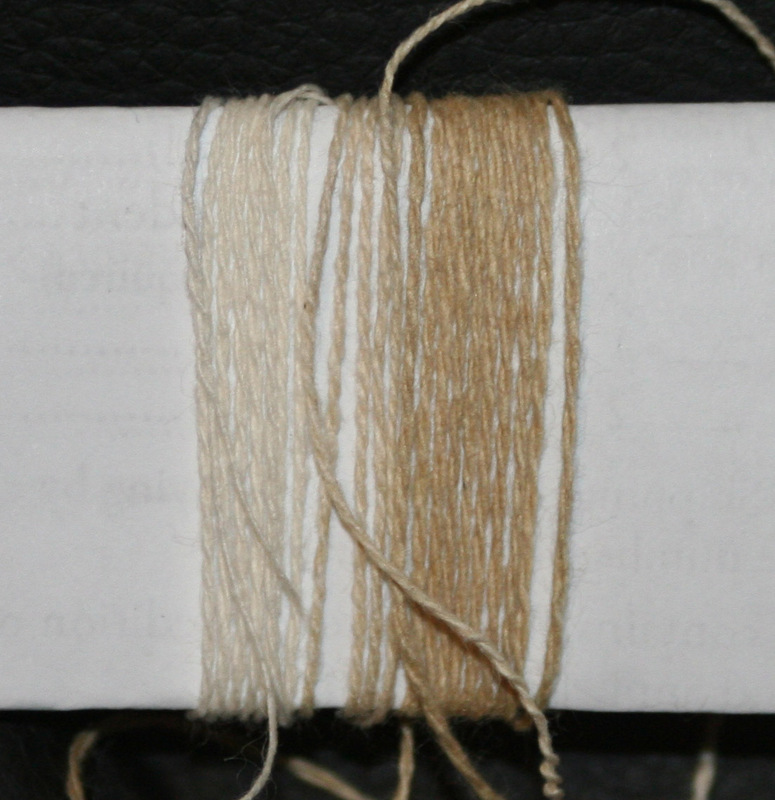 Â Rep weave and double weave both require about a sett 2x Â denser than plain weave; I might have to re-sley between samples, but the difference isn’t profound enough to require a totally different warp (i.e., I only have to beam on once). Â Two layers of turned twill would require a slightly denser set, but again, not enough to force me to rewarp. Â That would give me three structures, plenty for my article. 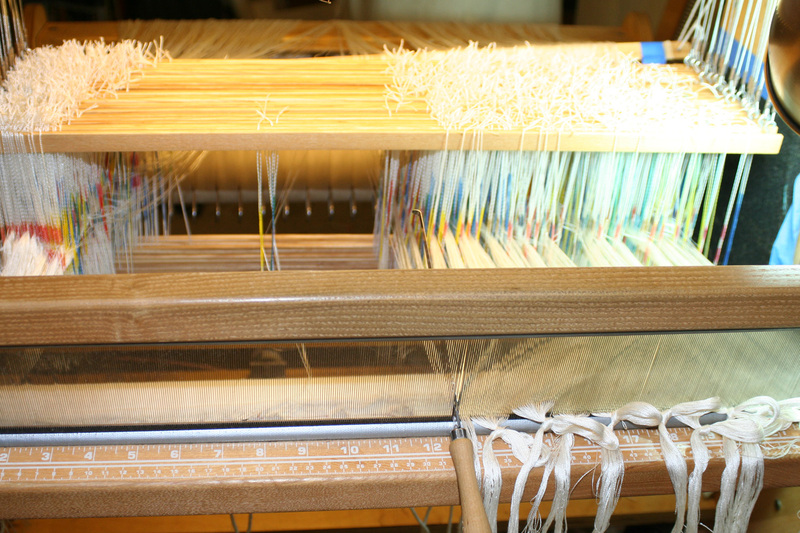 Â Rep weave is weavable on four shafts, double weave and turned twill on eight shafts – perfect! So I spent this morning figuring Â out the correct threading and tie-up for the three drafts. Â Because I wanted to thread only once, I had to work out a threading that would be compatible with all three structures. Â I wound up using a sixteen-shaft threading (two blocks of 8 shafts apiece). Â Then I worked out the tie-ups (rather fiddly work! ), and now I have three drafts that ought to work. Â Tonight I’m going to cut the Autumn Splendor sample (which was failing drastically – breaking four or five warp threads on the left side with every half-inch or so; need to troubleshoot that later) off the loom and start warping up for the new draft. Â I’m hoping to have it woven and off the loom by this weekend, so I can start warping up The Big Huge Gynormous Warp (37 yards of 60/2 silk). 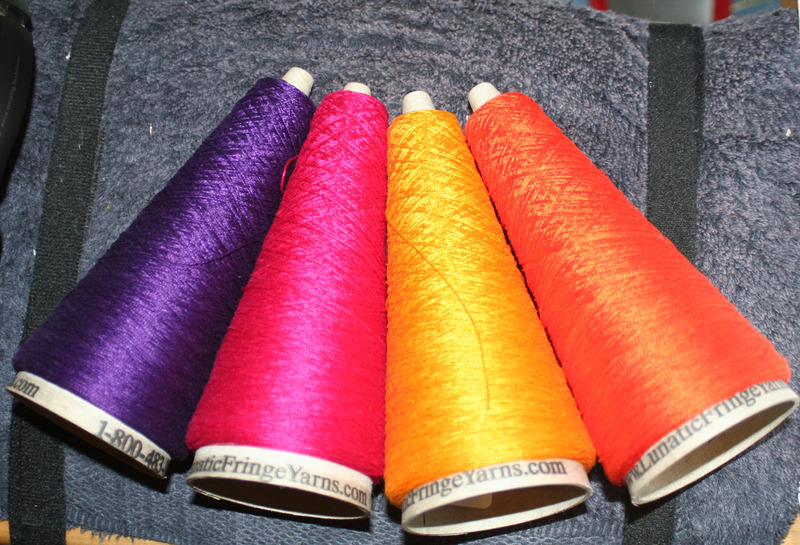 The colors in the center will be the warp colors (hence the colors for the warp rep sample); the colors to the side are to be used as the colors for double weave wefts. 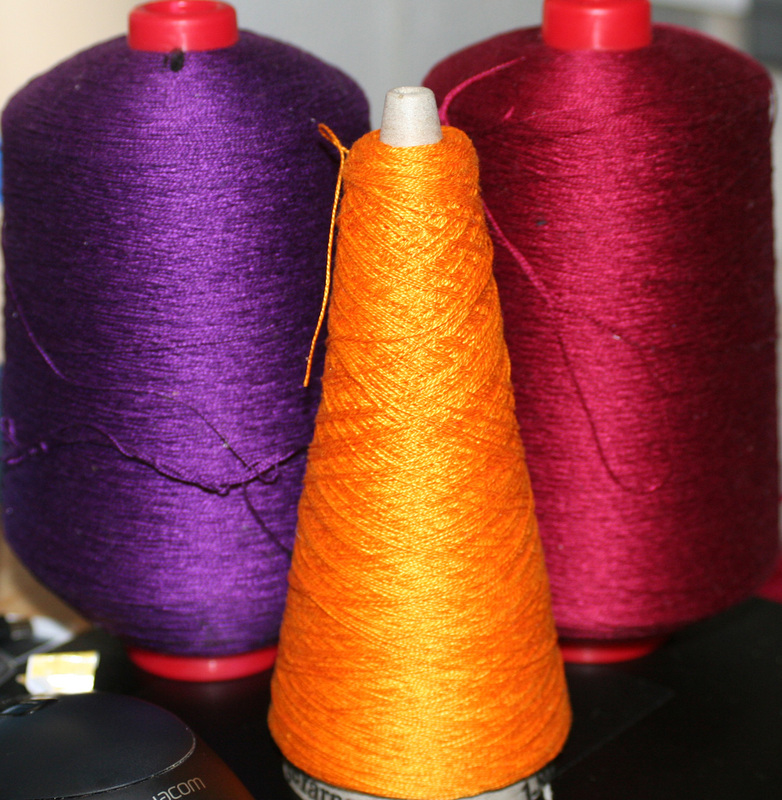 Â I will probably use yet another pair of colors for the turned twills. I think that ought to be plenty, don’t you?